The next meeting of the Society takes place on Thursday 8th January at 7:30 pm in St. Andrew’s Church, Bilston Street, Sedgley. Members and visitors are invited to come along and show items gathered over the years or made in their spare time. Everyone is invited to bring along collections, artefacts, photographs and memorabilia or just tell stories about their interests. Start the New Year by sharing your memories and ‘treasures’ at this friendly gathering. Take the opportunity to check the attic and cupboards for long forgotten collections and ‘stuff’. The early Victorian house, on the Dudley Road in Sedgley, was built for Thomas and Eliza Tinsley, Sedgley’s well known nailmasters. Now a detailed history of the house and its occupants is set out on an interpretation panel in the grounds. Detailed research was undertaken by the Society and members of the community. 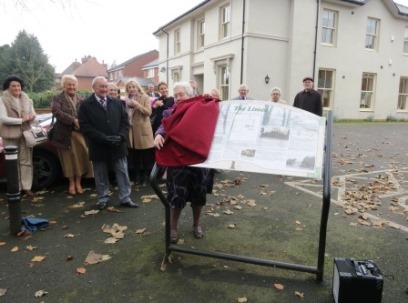 The panel was unveiled on November 21st 2014 by Mayor of Dudley, Cllr Margaret Aston. If you can't make it to The Limes, download a PDF version of the interpretation panel. 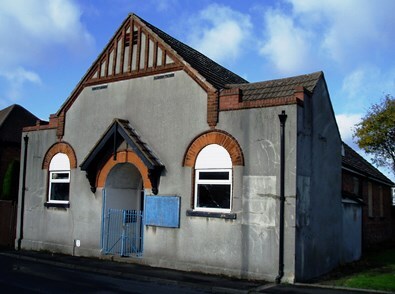 This building once played a central role in the life of a community. Now its services are no longer needed? St. Cuthbert’s Mission Church still stands in Broad Street, Wallbrook, Coseley. Worship began on October 27th 1896 and ended on July 4th 2004. Demolition was planned for autumn 2008 and the land used for two houses. In 1919 the Christ Church Mission was taken over by the Church Army. Captain Vivian Budden was appointed in October 1925. He stayed until October 1982. The intervening years were marked with periods of unemployment, World War Two and the total redevelopment of Wallbrook in the 1960s.